For this mani I paited my nails with Accessorize Pink Spice. I’m not a big fan of this colour, but I can’t resist a bargain, and this polish was £1.20. Unspectacular nail colours are often the most amazing backdrops for stamping “nail art” (which isn’t really nail art because there’s no skill required and, believe me, everyone can do it). So I stamped! I used my cheap JQ-L04 stamping plate. The black polish I stamped with is Revlon Colorstay 270 Stiletto. I think this mani looked alright. 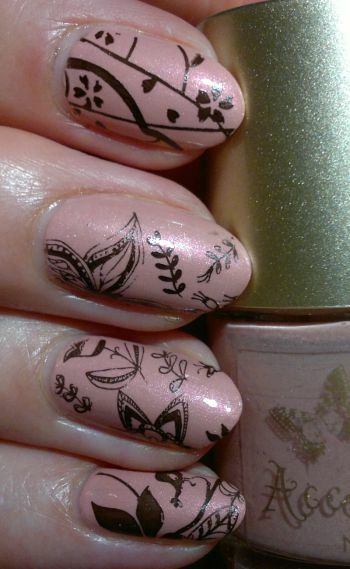 I like the images, and I think I should use this stamping plate more often! 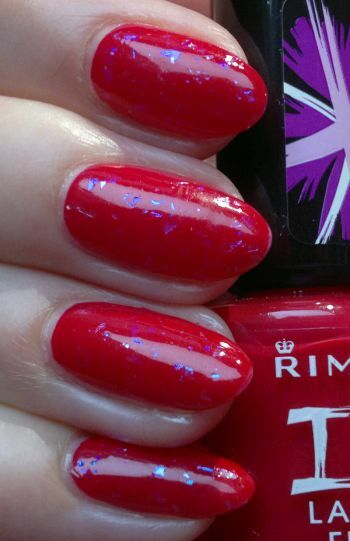 For this mani I painted my nails with Rimmel Lycra Pro 500 Peppermint (pinkies, index fingers, thumbs, 2 coats) and Accessorize Truffle (middle and ring fingers, 2 coats). For the images I chose Pueen‘s 55 plate (which is part of Pueen‘s Stamping Buffet collection). The 2 polishes I stamped with are Rimmel 60 Seconds 820 Hot Black To Go (black) and Revlon Brilliant Strength 110 Hypnotize (gold). This was another mani that was inspired by boredom, but I think it looked quite nice. Hi there! 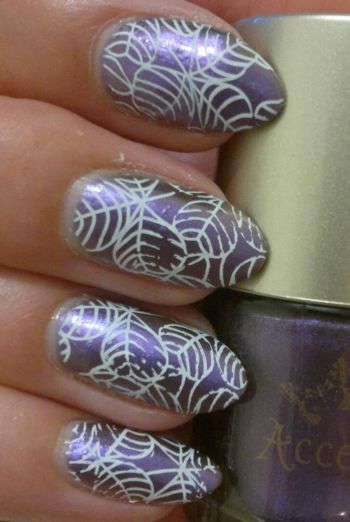 Today’s Nail Of The Day post is about a mani I did a while back. This mani is another one that I did for the A-Z Nail Art Challenge. And it’s for the Animals challenge. 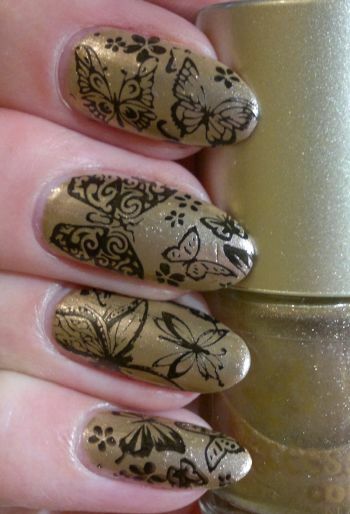 I used a number of branded and unbranded stamping plates with butterfly images. The black polish I stamped with is my trusted Rimmel 60 Seconds 820 Hot Black To Go. I think this mani is actually quite. Do you agree? Feel free to comment. And thanks for reading! Hi there! Over the past two months I’ve done more manis than I showed you. So I thought I’d do another nail week this week. I grabbed a random stamping plate (sorry, I don’t remember which one), picked a random image, and then I just started to stamp. 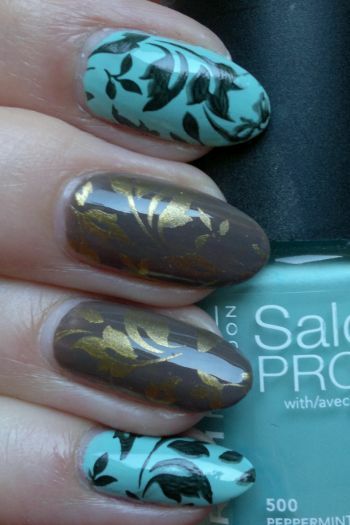 As you can see the image didn’t transfer well at all – so this mani was a complete nail fail! The necklace on the left is basically a super cute little owl that’s ‘hanging’ from a branch. I bought it years ago – at Claire’s Accessories. But I still love to wear it. The necklace on the right is another one I bought ages ago – but this one’s from Accessorize. I really love my melon (slice) necklace. It’s cute, but it’s not over the top. And I love to wear it to work. Let’s start with the top row! I wasn’t happy with the pigmentation and the texture of most of these eyeshadows. Number 4 – a bright gold – was the only convincing eyeshadow in this row. 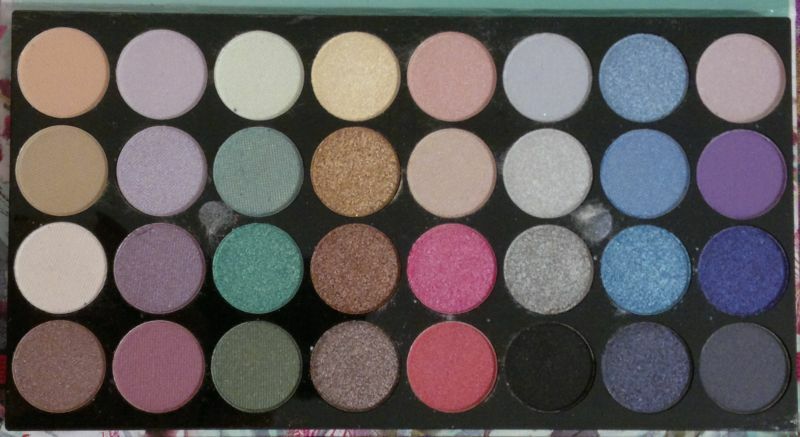 The seven remaining eyeshadows were poorly pigmented. Disappointing. The eyeshadows in the second row were a bit better in terms of pigmentation. Shade 4 – a bold bronze – really stood out. However, the mattes were still chalky and row two was still not convincing. The third row is bursting with shimmer eyeshadows, so of course these eyeshadows are much more pigmented. I am very happy with the colour payoff of six of these eyeshadows (shades 3 – 8). But it’s too bad that I don’t like most of the shades. And now to the bottom row! I thought that the eyeshadows in this row were a very nice surprise. I’m very happy with the colour payoff and the texture of all of these eyeshadows because they’re easy to blend and they’re highly pigmented. 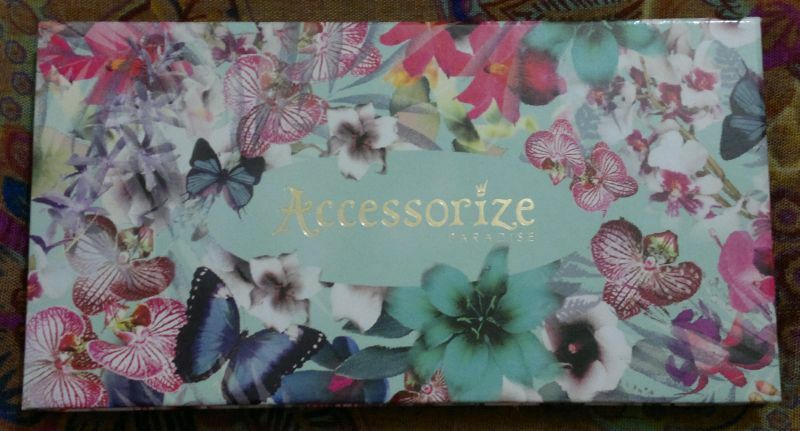 I think that Accessorize’s Paradise eyeshadow palette is not great. 16 eyeshadows are highly pigmented – but the other 16 are not. The palette was £6 only, and I think the design is very cute. However, unless you buy it for the design or you’re a collector, you won’t love this palette.